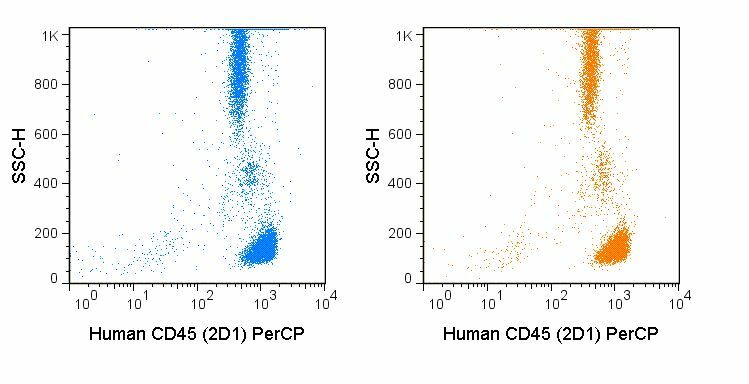 The 2D1 antibody reacts with human CD45, one of the most abundant hematopoietic markers and one that is expressed on all leukocytes (the Leukocyte Common Antigen, LCA). CD45 is a protein tyrosine phosphatase existing in several isoforms, each being generated and expressed in cell-specific patterns. With its broad cell distribution, CD45 is critical for many leukocyte functions, regulating signal transduction and cell activation associated with the T cell receptor, B cell receptor, and IL-2 receptor. Other forms of CD45, with restricted cellular expression, include CD45R (B220), CD45RA, CD45RB, and CD45RO. 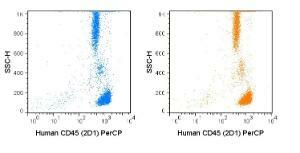 The 2D1 antibody is widely used as a marker for human CD45 expression on peripheral blood T cells, B cells, monocytes, macrophages, and NK cells.